Cairo—As expected, many things went wrong on the first day of Egypt’s first post-Mubarak parliamentary elections. Ballots arrived late at approximately 900 polling stations and, in a few cases, angry voters held judicial monitors hostage after their ballots failed to arrive. Meanwhile, candidates nationwide scrambled to correct their campaign literature when they found that their numerical ballot placements did not match the numberings that had been announced prior to the election. “His ballot number was supposed to be 127, but in the polling place it’s 126!” the nephew of one candidate told me. “Please report this.” (Done.) And in many places, lines were incredibly long—including a seven-hour wait for women voters in the relatively wealthy, northern Cairo neighborhood of Heliopolis. But despite the day’s various frustrations and confusions, one thing seemed quite clear at every polling place that I visited: The Muslim Brotherhood’s Freedom and Justice Party is poised for victory. From the moment I exited the Metro station in Heliopolis, a Freedom and Justice kiosk greeted me. Beneath an awning and surrounded by Freedom and Justice banners, young Brotherhood activists directed voters to the proper local polling stations, the addresses of which they wrote on specially designed, Freedom-and-Justice-emblazoned palm cards. The scene was bustling, as Brotherhood members welcomed voters to the table, took calls, and handed out additional literature. “We expect to win,” says Mohamed Fouad, 26, one of the kiosk organizers. “But we don’t know what percentage we’ll get.” So to boost their turnout and their prospects for victory, the Brotherhood has orchestrated a massive get-out-the-vote effort, dispatching—according to the organization—40,000 volunteers in Cairo alone to “safeguard the elections.” It also doesn’t hurt that the Brotherhood’s Guidance Office, which is the organization’s supreme body, has commanded its members to vote for Freedom and Justice candidates, thereby ensuring a massive pro-Brotherhood turnout. To be sure, the Brotherhood wasn’t the only group that had organized effectively for the elections. 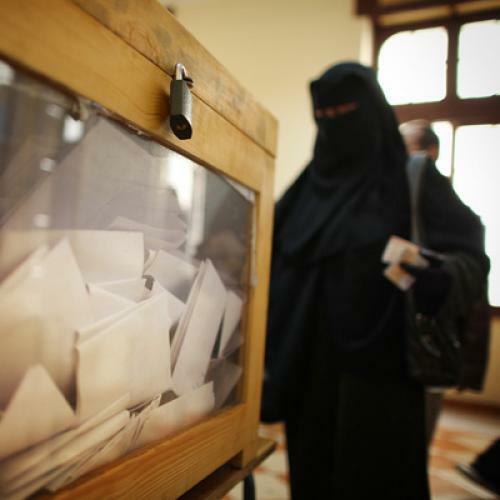 In Heliopolis, a few independent candidates had also set up stations, and in many areas the ubiquity of Freedom and Justice banners was matched by that of the Salafist Nour party, which is reportedly making an especially strong showing in lower income neighborhoods. But what makes the Brotherhood’s showing so remarkable is how consistent it is: they are, simply put, everywhere. And given that they are pushing an Islamist message that holds visceral appeal for the religious Muslim public of Egypt, they may have devised a formula for victory. Yet the Brotherhood’s excellent organizing should enable it to overcome two other major challenges. The first challenge is Egypt’s absurdly confusing balloting system. Voters cast one ballot for their preferred party, which elects a slate of party-affiliated candidates that will comprise two-thirds of the next parliament; and another ballot on which they choose two individual candidates – one professional and one worker – who will comprise one-third of the parliament. To complicate matters further, there might be as many as fifty parties on a given party-list ballot, and dozens of names on the individual-candidacy ballot. And for the quarter of Egyptians who are illiterate, there is yet another complication: each candidate and party is assigned a unique graphical symbol, though some are easy to confuse (such as the separate symbols for clock and wristwatch), while others are hard to discern (even Google Translate took a while to figure out that a circular object that in Arabic is called “tirs” means “gear”). The Brotherhood’s kiosks, however, enable it to properly advise voters who might otherwise get lost in very process of voting. The second challenge is the ever-present threat of violence at the polling places. The Brotherhood’s omnipresence near the polls enables it to maintain a certain level of security. I got to witness how this might work on Monday in Sayida Zeinab. A few blocks from the polling location, a man suddenly emerged brandishing a large sword, and walked menacingly down the street screaming, “I will stay here. Nobody will move me.” Nearby, a young activist appeared prepared to use a long neon lightbulb as a weapon, while a third youth removed his belt, apparently to use it as an improvised whip. (Rest assured that your intrepid reporter, who was already a full block away, bravely ducked into a side street until the commotion ended.) Word soon reached Muslim Brothers inside the polling place, and they emerged to consult with their counterparts who were manning the Freedom and Justice kiosk. The scene settled down, thankfully, without any violence—but had things turned ugly, the Muslim Brotherhood clearly had the manpower to respond. Shams el-Din similarly expressed his support for instituting Qur’anic hudud punishments, under which thieves are punished by having their hands cut off. Meanwhile, Mansour—the kiosk manager in Manial—expressed his approval when I told him about a young Muslim Brother who once told me of his wish to die as a martyr in Palestine. “It’s the same feeling for everyone who loves God and who wishes to die for the sake of God,” he said. There are other, non-theocratic parties and candidates vying in this election, of course. But they simply haven’t shown the will, or perhaps the ability, to organize and mobilize voters consistently across the country. Indeed, judging from the first day of voting, it’s the Muslim Brotherhood’s theocratic political vision, empowered through elections, that seems to be in Egypt’s immediate future.